The Whidbey Island Map will help you locate cities, towns and highways. Pamper yourself at one of Whidbey Island's luxurious bed & breakfasts (see "Accommodations") or take your camping gear to one of the state parks (see "Attractions") and experience for yourself this retreat popular with local Puget Sounders. In addition to offering a laid-back atmosphere and romantic get-away-accommodations, Whidbey Island also is in the "rain shadow" of the Olympic Mountains and receives half the annual rainfall of Seattle. Narrow country roads winding through farmland allow for a relaxing drive and welcome respite from the freeways of the mainland. Small towns and villages offer pleasant shops, casual browsing and good food. State parks provide easy access to outdoor activities and scenic views of Puget Sound and distant mountains. History buffs will note that Whidbey Island has long been viewed as a key defense site. There are military relics from other eras, including 19th century blockhouses originally built to protect against Native American attack, concrete bunkers from World War II, as well as today's Naval Air Station Whidbey, which is in operation near Oak Harbor. While soaking up the history, stretch your legs with a seven mile hike along the shoreline from Fort Casey to Fort Ebey. Whidbey Island also can provide an enjoyable route to other destinations. You will find excellent ferry connections to Seattle, the Olympic Peninsula and the Olympic Mountains. 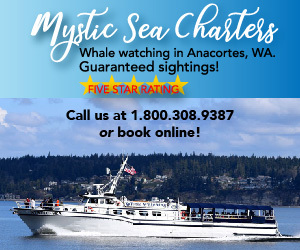 Or, drive north and cross the beautiful and dramatic Deception Pass onto Fidalgo Island and visit the city of Anacortes. There, you can catch a ferry to the San Juan Islands, or, take time out to enjoy the city's many shops, galleries and other attractions. You also can head east on State Route 20 to Interstate 5 and take the freeway to either Vancouver, British Columbia or to Seattle. Otherwise, stay on Highway 20 and follow it to the North Cascades National Park and other recreational areas of the Cascade Mountains.